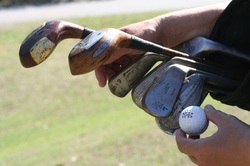 The mission of the Professional Hickory Golfers Association is to promote and encourage the playing of Hickory Golf. To establish a society of like-minded professional hickory golfers. To assist members and others in discovering the playing characteristics of wood shaft golf clubs. To promote the experience of golf in a manner consistent with how the 'royal and ancient game' was played in the hickory era. To organize professional hickory golf tournaments. To celebrate and remember the pioneer professional golfers of a bygone era. To keep history alive and relevant.